ST. PAUL, Minn. -- A raccoon that captivated St. Paul and the internet Tuesday while scaling a skyscraper was starting to make its way down late Tuesday night, CBS Minnesota reports. Tuesday afternoon, the raccoon had stopped on a ledge more than 20 stories up. At about 10:30 p.m. CT, the raccoon began to descend from the 23rd floor, making it to the 17th story. But at some point, the critter reversed course again, apparently climbing from a window ledge to the very top, and was on the roof, out of sight. There was no word on whether it made its way to a live trap on the roof with some very aromatic cat food it was hoped would lure the raccoon to safety. It all started at about 11 a.m. Tuesday when Minnesota Public Radio reporter Tim Nelson noticed the fuzzy friend trapped on an overhang near the bottom of the UBS Building in downtown St. Paul, CBS Minnesota reports. "The maintenance staff came out with some two-by-fours screwed together and pushed them up to the raccoon, thinking that he would run down the boards onto the street and escape," Nelson said. But when raccoons get scared, their instinct is to go up — and that is exactly what this one did. 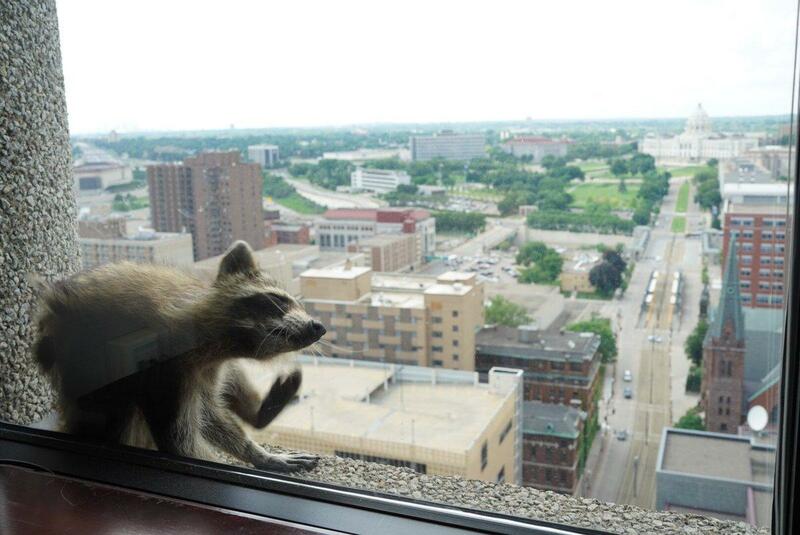 Looking like a smaller, hairier version of Spiderman, the raccoon was able to scale almost the entire building, finally stopping to rest outside the Paige Donnelly Law Firm on the 23rd floor. "We have seen him pace back and forth and sniff, but he hasn't moved," attorney Sheila Donnelly-Coyne told CBS Minnesota. "He might just be tuckered out from the climb right now." There is not a whole lot that St. Paul Animal Control can do because a rescue mission would be too dangerous for both the raccoon and the workers. "This raccoon has to rescue itself," Nelson said. "That's the only option right now." Minnesota Public Radio branded the raccoon with the hashtag #mprraccoon, which became the top trend on Twitter. The woodland creature also had its own Twitter account, with one tweet saying, "I made a big mistake." Many feared for the raccoon's safety.